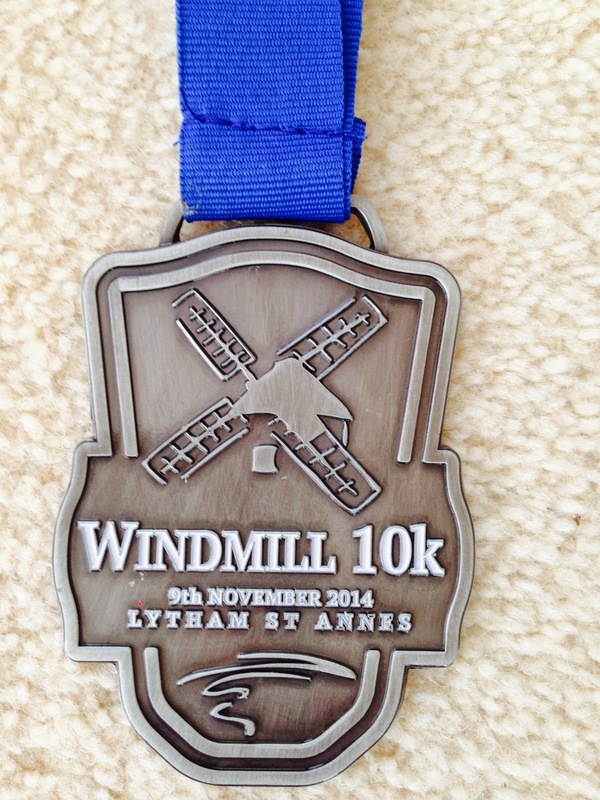 On Remembrance Sunday, the 9th November 2014 I ran in The Windmill 10K which took place in Lytham and was a sell-out race! I set my alarm for a 8am get-up and had my usual pre-race breakfast of porridge and a banana. Luckily the weather was clear and dry although rather chilly. We left our home town of Kendal at 9am to travel the 55 miles to the event headquarters which was situated at the Lytham Windmill on the coastal road through Lytham. 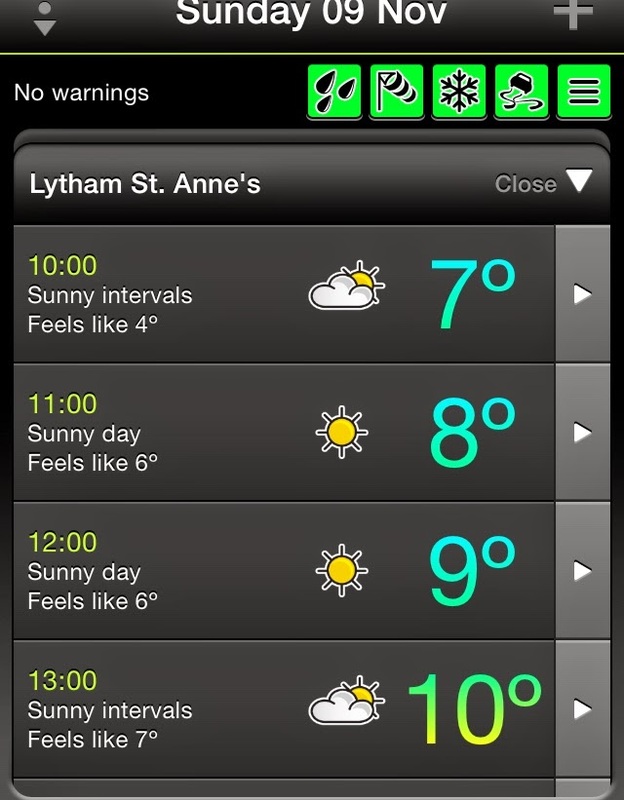 We arrived in Lytham just after 10am and got parked on one of the side streets close to the start line. I collected my race number without queuing and I was amazed that there was just a short queue for the toilet too! At around 10.50am I headed to the start line for the 11.05am start! It wasn't a chip timed event so I tried to start as close to the front as possible, to get as accurate a time as possible, without getting in the way of faster runners - it is a very fine balancing act! It was a very memorable day with a respectful 2 minutes silence before the start, along with a reading of a very moving poem and the last post. When the race started my legs struggled to get going as they had gone numb with cold due to the inactivity during the ceremony! I was slightly worried that I was going pull a muscle or worse and tried to take it easy until the circulation returned to my muscles! We set off from the Windmill along the coastal path towards the town. In the early stages of the race there was plenty of spectator support cheering us on. It was a very chilly morning with a cheeky little sea breeze making its presence known! As this was advertised as a fast and flat course I had my eye on a PB. Despite feeling stiff and cold I ran the first mile in a 7.41 minute mile which I knew I couldn't sustain, mile 2 was slighter slower at a 7.55 minute mile and mile 3 was at a 8.08 minute mile. At around the halfway point there was a water station with bottled water. I took a bottle and had several swift gulps before discarding the bottle and continuing on my way around the Fairhaven Lake then back towards Lytham Windmill. During this return section the wind seemed to get stronger and I felt like I was battling it more as I headed towards the finish! I ran mile 4 much slower in 8.28, then mile 5 in 8.34 and the final mile in 8.35. Glancing at my Garmin I knew I was on schedule for a 10K PB but by now I was chasing a new goal of a sub 50 minute 10K which I had been dreaming of for a while. I found this final mile endless as I could see other runners looping back towards the finish whilst I was desperately still battling onwards into the wind. Once I looped back I was running on grass which made keeping a faster pace more difficult. I pushed as hard as I could as I headed to the finish looking to the big clock above the finish for confirmation of my time but it just showed a line of zero's! I was dismayed to see it wasn't working. The route heading towards the finish line was lined with spectators cheering which encouraged me to keep pushing despite not knowing the time! As I crossed the line the big clock changed from the zero's and flashed up as 50.00! Would my time have been recorded despite this malfunction? I stopped my Garmin and was amazed to see not only a PB but a sub 50 minute time too! My Garmin stated a time of 49.38, now I just needed to wait with fingers crossed for the official time to confirm I had done it! I was handed a medal, a bottle of water, a banana and a Wagon Wheel once I had finished. All in all an excellent race and very well organised with fantastic bling! One I would definitely recommend to others and one I would run again myself! My Official time was confirmed as 49.36 - I am delighted with this! I had managed to knock 3 minutes 16 seconds off my previous best 10K time and got a sub 50 minute time too!